Guests will include Sir Roger Moore, who played British spy 007 in the 1970s and ’80s, Chanel designer Karl Lagerfeld, U.S. soprano Renee Fleming, and Bernard Arnault, the CEO of luxury giant LVMH, the wealthiest man in France. Last night the couple celebrated their upcoming nuptials by attending a rock concert (pictured) performed by the US band The Eagles with 16,000 Monegasques. The full progamme is below. 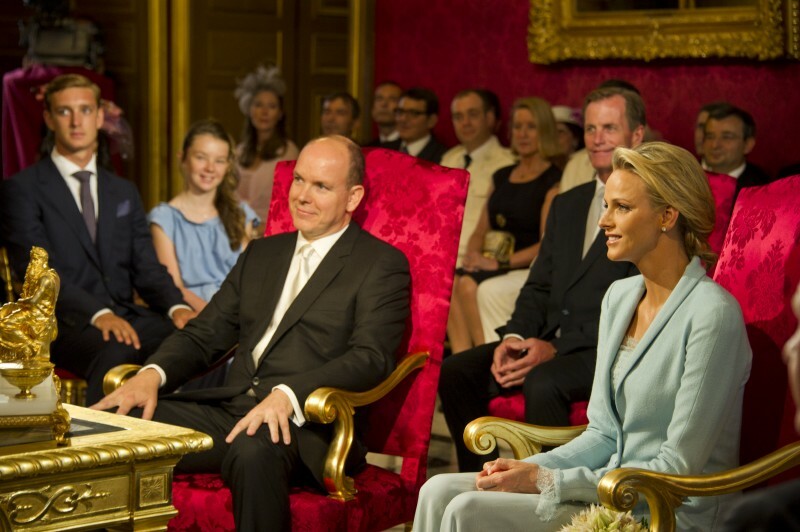 5pm: The civil wedding will take place in the Throne Room at the Prince’s Palace. It will be celebrated by Philippe Narmino, President of the Council of State. Mr Philippe Narmino is the Sovereign Family’s civil registrar. Monegasques will be able to follow the ceremony on giant screens in the Palace Square. The Square will be open to locals and their families at 4pm. 5.50 pm: Following the ceremony, the royal couple will make an appearance on the balcony of the Hall of Mirrors. 6 pm: Monegasques will be offered a buffet cocktail in the Palace Square. The Mayor Of Monaco will present the royal couple with the gift given by the people. The royal couple have said they do not wish to receive any gifts for their wedding, but would like donations to be made for the benefit of foundations and associations. 8 pm: Residents of the Principality will be invited to a reception in the harbour. 10 pm: A concert will be laid on by the royal couple in Port Hercule and musician Jean-Michel Jarre will stage a unique son and lumière spectacular. 5 pm: The religious wedding will take place in the Main Courtyard of the Prince’s Palace. Miss Wittstock, on her father’s arm, will walk along a red carpet from the Carabiniers Barracks to the altar. His Grace Bernard Barsi, Archibishop of Monaco, will celebrate the mass. 6.30 pm:The royal couple will leave the Palace for Sainte Dévote’s Church so that the Princess can lay down her bouquet. Giant screens will be set up in the Principality so that people can follow the religious ceremony and the royal couple’s wedding route. 9.30 pm: The official dinner and the ball will take place in the Opera Garnier and the Casino Terraces. The dinner will be prepared in the kitchens of the Louis XV at the Hotel de Paris with the support of staff from establishments belonging to the Société des Bains de Mer of Monte Carlo. Over 450 guests will attend the dinner, which will take place on the terraces of the Garnier Opera House.